Growing up, I was a voracious reader. The books of my childhood were full of Canadian classics by L M Montgomery with her iconic curly topped imaginative “Anne of Green Gables” and early feminist and abolitionist American author Louisa May Alcott known for her book “Little Women” plus many other authors. This hunger to discover worlds beyond my own through other’s words remains… though the quantity and range has reduced over the years… and for a time nearly stopped as the business of ‘living’ took over a love of literature. With a slightly slower pace this year, my love of reading has resurfaced. Conveniently, new books keep landing at our doorstep courtesy of friends and their coteries publishing their creative works. In literary circles, my partner is known for lending his rich baritone to readings at book launches. Which means many books in our bookshelves are gifts, signed by their authors. Amusingly, when we combined our book collection 3.5 years ago, we found some in common. Thankfully, many were distinct, so we have little need to visit a ‘library’ to locate something interesting to read… instead we have only to wander over to our living room and pluck something off the shelf. And yet these books are a mere fraction of what I’ve accumulated over the years. My early academic phase alone spawned more than our entire current collection. One of the challenges during our recent trip to Winnipeg was to unearth boxes stored with my parents to say a fond farewell to beloved books that will never make the journey across the oceans from Canada to India. To put into perspective, when I moved back to India in 2003, there was a ‘question mark’ whether life back in India would work or I would return to resume life in Canada. I left Canada with some 70+ boxes carefully labeled and stored with family. Over the years, the quantity has gradually been culled. 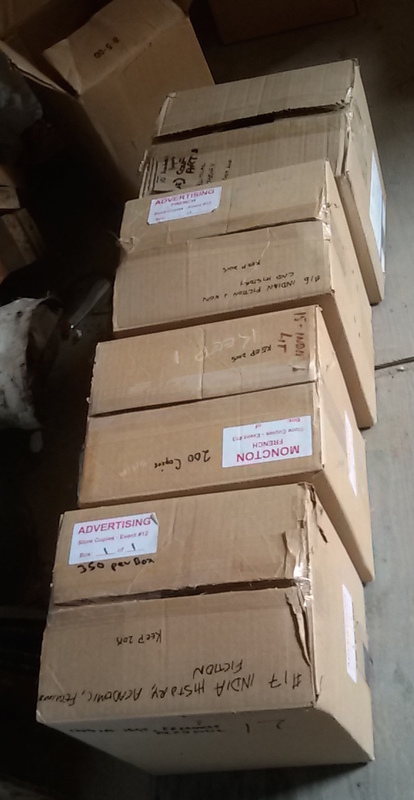 Boxes ‘n boxes of beautiful books! Ship if… for those precious books I will send to India at likely a silly cost rather than part ways forever… irrespective of whether we have space in our current location! 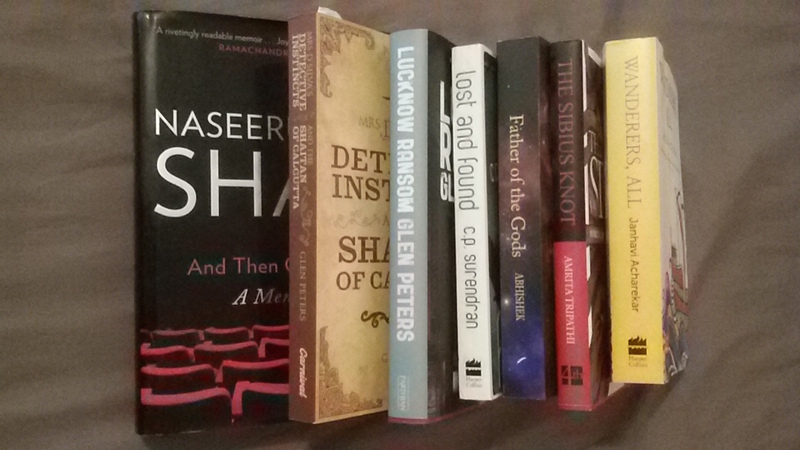 Looking at the label of the 1st box – Indian fiction – I thought there should be many I could add to the ‘go’ pile. To discover the top book was a collection of short stories edited by someone unknown when purchased and now close enough to be my Delhi host on my last trip! Arghh!! Book after book that meant one thing when originally acquired morphed into new relationships as interesting authors whose works I enjoyed from a distance now pop home during trips through Mumbai. Or works which opened new paths to wander, now represent familiar haunts part of my everyday reality. How to say farewell to these now comfortable old friends? And it wasn’t just books! How to put into recycling a decade of research, copies of court cases never before and likely never again to be compiled in the same meticulous way as an earnest graduate student? Yet how to justify keeping when the likelihood of returning to Canada or ever having space for all these paper companions seems impossible? Yes I may still harbour a dream of owning a home with its own library – a cosy room with wall-to-wall floor-to-ceiling books, a grand piano, plush leather sofas and comfy corners to curl up and read. It is a lovely fantasy. One that even my partner shares. 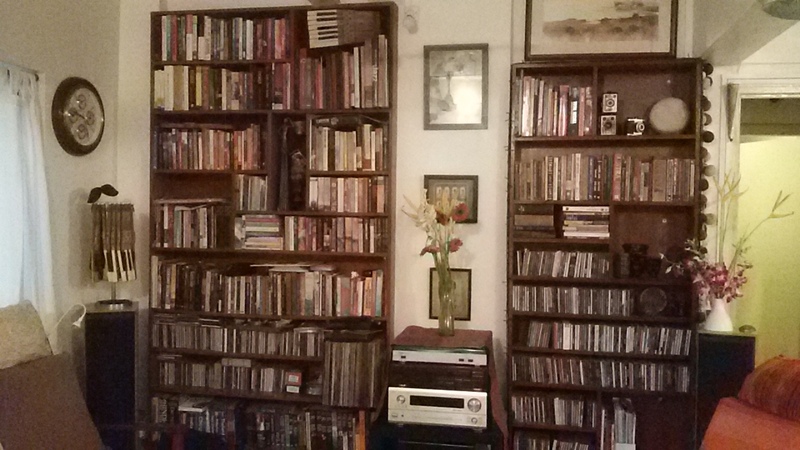 However we have indulged our desire by building bookshelves in our wee flat in Bandra. Which meant, I had to bid adieu to most of the memories encased in the trappings of paper. I may not have said ‘farewell’ to all… however this trip left a more manageable number. I’m no stranger to letting go. Anyone who moves knows that you always leave something behind. As my homes get successively smaller with each move, hard choices are made. 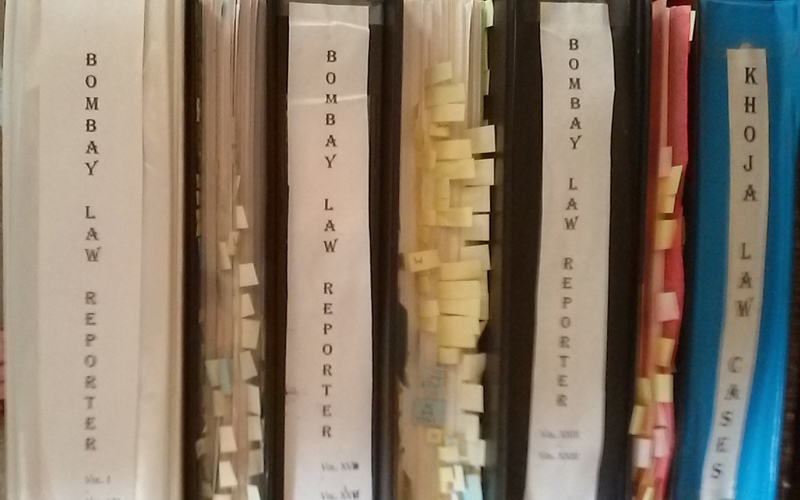 Even the move to our Bandra flat came with eliminating 4 large boxes of books. Anyone else still have boxes scattered around the globe of ‘stuff’ you secretly hope to ‘re-unite’ with one day… knowing full well such an event is unlikely? Am I alone in having a slightly irrational emotional connect to physical books, memories of when first read and a desire to keep them around? By Carissa Hickling in Canada, Play on August 5, 2015 . At least yours are only in one place! That’s not bad. 🙂 Mine were a bit scattered around however now significantly reduced and consolidated on accessible shelves in my parent garage. Can totally relate to your post! We are in the process of culling ourselves. We decided to rent a large home on our return to the U.S. from China. The idea is that it would allow us to bring in all our boxes from storage from three different moves, open them all up, cull with determination, and then downsize! As in your case, my husband and I also have two copies of many books from our respective collections! 🙂 Opening them all up, all I wanted to do was spend the rest of my life in the living room, reading. But we are starting to realize that life is finite (a big change from when we were in our 30s and it all seemed endless) and there are only so many books we can really read. Even so, I agree, it is very hard to let go of books and painstakingly written graduate thesis, projects, reports — paper monuments to our past. I love your description “paper monuments to our past” – so completely true!! 🙂 And wish you nothing but the best with your determined culling combining collections from three moves! We just downsized homes in the spring, and I had to part with boxes upon boxes of books. The only thing that made me feel somewhat okay about it is the fact that all were donated. These days I only buy eBooks – because I can take all of those with me, wherever I go, one one small device. It’s funny but I have a few different ‘categories’ of books… I prefer reading the standard popular fiction on my kindle. However for ‘literature’ type works or books written by friends, strongly prefer physical books. Somehow they don’t seem ‘real’ on a kindle which is for those that I’m just as happy to slurp up and move on from without the extra clutter. Not anymore 😦 I went through this years ago. My Dad’s extensive library was almost completely lost. Some of the books had just fallen apart in the 3 decades of humid heat of Calcutta, some I managed to salvage. Right now I’m trying to rebuild that library bit by bit. Some of those authors are hard to find now. As an aside: I still have notebooks from the early days as an eager eyed programmer from the days when programming was an art, escape sequences to manipulate screens, cursors, printers ( dot matrix graphics 🙂 ) all neatly catalogued by machine and OS type. Ah the days of 8-bit computing – cutting edge stuff. Indian conditions are hard on books. One of the reasons I’ve been reluctant to bring the balance of (much reduced!) collection here. You had cassette tapes though – which disintegrated after a couple years. Those I remember as purchased them! Oh yeah! I still have those mixes made specially for those parties that ran all night with plenty of booze, food and dancing. What I can’t find is a player to play them on … but I’m not throwing those cassettes out. Not yet. There’s a lot of memories in them thar tapes .. When I first left Oz to move to Canada I left a few photo albums/scrap books of my previous travels, and retreived them a few years alter. But when Don and I sold our home 4 years ago almost everything went. We have a small storage locker and even so I think half of what’s in there could go. I don’t miss any of it. 90% went in the big move from Canada to India in 2003. All that remained was those 70 boxes and a couple other items with my sister that I let her know once we decided to stay to find new homes for… Now the number has been reduced to under a dozen. Here is the question – do you still have your photo albums / scrap books? Or did you digitise the photos and let go of the physical albums? I still have them – in a box way in the back of our small storage locker. They are no doubt decaying and faded, maybe even moths. Could never bring myself to part with them. Yeah, speaking as someone who has just culled my books down to 1 small box (I have to pay for my storage) I feel your pain. One small box???? I’m equally impressed and horrified. 😉 I more than feel your pain… it was tough enough to get down to below a dozen but one?? Squeak!!! Yeah I just kept the ones signed by the author, plus a Sylvia Plath that I couldn’t beat to let go. £136 a month for the next size up in storage unit. I don’t love any of my possessions that much. Like you I recently culled my books- I was cleaning my many many bookshelves when I realized that my old friends were languishing and suffering under the layers of dust on them. It was time to set them free to be alive again in another reader’s mind. Although I couldn’t bear to part with them, it also felt wonderful to be know they were getting a second chance through the Salvation Army book drive. My shelves are now lonely – gave me the excuse to go buy more books ;). I am such a hands on person with memories, too. I love to pick something up so it’s so hard to part with stuff, books included. I gave away my entire Trixie Belden collection when I left Canada in 2005. 😦 It’s nice to know others find it hard, too. The funny thing for me is, out of sight, out of mind. I often wish someone else would purposely lose my boxes. It’s only when I open them up that I sigh and sit amongst all the memories before closing them back up, unable to let go, once again. Haha! Out of sight, out of mind does bring perspective, eh? I find I’m able to bring a little of that back when sorting through things. Somehow books are the toughest for me though. 😀 This reminds me of our pile of rejected stuff at our front door at our old place. “Gifts” were quickly relegated to the junk pile if I had no desire to keep them and we’d do a donation drop off every few months. Books and papers are hard for me, too. I think, maybe I can use it! Or, maybe someone else can use it! Or, maybe I’ll need to start a fire and have no kindling handy! You know I used to be a book hoarder and I realized I never really re-read any of them. Here in California we’re blessed with a great public library – where I donated 90% of my books and now it’s much easier to let go of even my favorite books. When in India, I used to buy a book and leave on the plane or the train with a little note hoping someone would pick it up and read it. There are terrific libraries in N America! I miss them even now.. even worked in the Winnipeg Public Library system for 5 years… In India the options just aren’t the same – either buying, selling, borrowing or giving… Sigh….